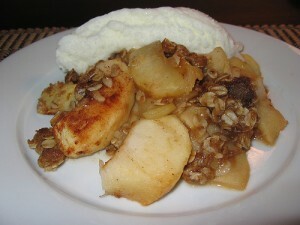 Apple Crisp recipe by Naz at DesiRecipes.com. Chunks of lightly sweetened apples covered in a crisp and crunchy topping. Place apples' slices in 9" round glass pie dish. In a mixing bowl, combine flour, oats, sugar and cinnamon . Cut in butter until crumbly. Sprinkle evenly over apples. Microwave on HIGH for 10-14 minutes or until apples are tender. And than at last but not least.... eat it !! !